Before the first stitch is made, and before the drafting pencil ever touches the paper, measurements must be taken. When measuring, the goal is to obtain as much information about the client’s figure as possible. Since most of my work involves Devere’s Handbook of Practical Cutting, 1866, I’m using his methods of measuring. Devere’s book is very descriptive in the measurements taken, but in the 1866 version, is lacking in illustrations. It took me a good while to figure out exactly what each measurement involved, and where it was supposed to be taken. Then, a couple of months ago, I came across some illustrations from Journal des Tailleurs, a French tailoring magazine published by Devere in 1858. It contained some beautiful illustrations of how the measurements were to be taken, but of course, had no accompanying text. So what I’ve done is take the text from Devere’s 1866 manual, and combine it with the images from 1858, as well as some diagrams from his 1856 edition. Hopefully that will make it easier for those of you trying to learn how to draft from his book. Soon, I will be simplifying the information here, cleaning up the images, and using it as a measurement form for long distance clients, who must measure themselves. You can think of this as a way to collect my research. This post will just go over the measurements for a coat, seeing as there are so many. A following post will discuss the waistcoat, trouser, and any other measurements. Devere broke the measurements into three groups, or series, of six measurements each. The First Series comprises the sizes and lengths, and shows at once whether the man is Long or Short-Bodied, Stooping or Extra-Erect, Thin or Stout Waisted. 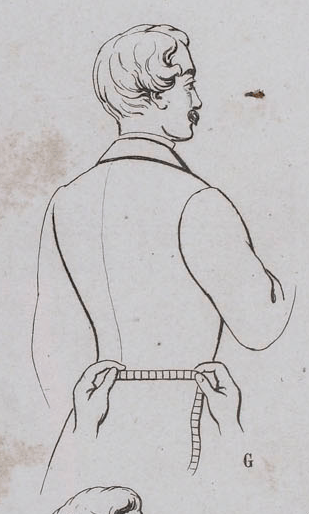 This measure is taken on the Waistcoat, under the coat, as shown on figure blank. Place the tape horizontally, raising it up as high as possible under the arms, without raising it at the chest, and hold the tape with the thumb and forefinger of each hand. The tape must first be drawn very tight, and afterwards be loosened as the client breathes, so as to obtain the size of this part with the greatest accuracy. In writing it down we must only put the half; for instance, 18 ¾ inches for 37 ½ &c.
This measure indicates the graduated measure, to use in the draft. It is 18 ¾ in proportionate men. 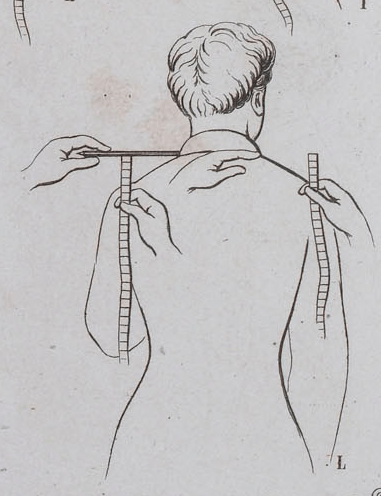 This measure is also taken under the coat: it goes round the body on a level with the hollow above the hips, see figure blank, and it should be taken rather easy. Like the breast measure, it is only written down as half the length taken; say 15 ¾ for 31 ½ inches. This measure, by comparison with the breast, shows if the waist is thin or stout. In the proportionate man it is 15 ¾ or 3 less than the breast. First button the coat, and press the body with the side of hand, just above the hips, to find the level of the hollow of waist, which is usually about 1 inch above the top of hip bone; make a short chalk mark horizontally at this level. Next place the brass end of the tape at the middle of back, on the same level as the chalk mark, and measure by the scale on the tape, the distance of the Centre Point from the middle of back, according to the size of waist; making a short chalk mark downwards at this distance, which with the first chalk mark will form a cross. The middle of this Cross is the Centre Point. N.B. 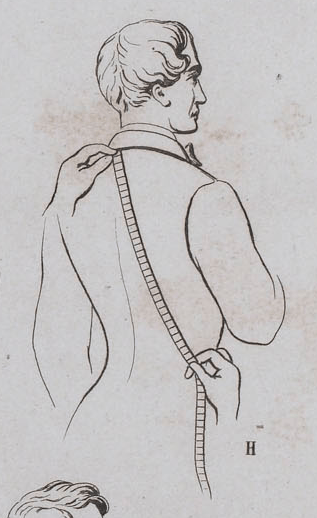 – If the client is wearing a loose-fitting coat, such as the paletot or a jacket, the fronts must be drawn together, or laid over, and fastened by pins or by a tape tied round the waist, so as to have the garment perfectly tight-fitting at the back, and over the hips. This being done, the Centre Point can be marked with as much accuracy as if the customer was wearing a dresscoat, and this is one great advantage of our especial System of Measurement. Sadly, we don’t have access to Devere’s special rulers to find the Centre Point. So we have to use the formula of taking 2/5 of the Breast or 1/5 of the full chest and using that number to find the centre point. For example, a 35 inch chest measured all the way around would be 7 inches to the centre point. So find the center of the back at the waist level and measure 7 inches around to find the Centre Point. Take the Bust and Curve part of the Tape, slip the eyelet-hole at the end of it over the head of the pin, and hold it there; the eyelet-hole must be exactly at the top of the back seam: then with the other hand carry the tape perfectly straight to the Centre Point, crossing the side seam near the middle, and not letting the tape be either very tight or too slack. Continue to hold the end of the tape at the top of back seam, and with the other hand pass the tape over the shoulder in front of the arm, close to the front of the scye, letting the clients arm hang down in its natural position; draw the tape very tight, to flatten any creases there may be at the front of arm, and carry it direct to the Centre Point. Now as the Curve and Bust measures both start from the top of back (a point which is always fixed and certain), and proceed to the Centre Point which is also fixed and certain for all sizes and structures; the difference between these two measures must, it is evident, show the exact difference that there ought to be, between the lengths of back and forepart. In a Proportionate man, the difference between these measures is 2 ½: it is less than this for stooping men, and more for Extra-erect men. Pass a pencil or penholder through the loop at the end of tape, and hold it tight under the arm (the arm must not be raised up, but should lay close to the body). Then measure the length to the Centre Point, so as to ascertain exactly, the distance between this point and the bottom of scye. This measure serves to rule the depth of the bottom of scye, and shows the degree in which it must be hollowed out below the side point. In proportionate men it is 8 ½, and is usuallyabout half the length of back to natural waist. It is longer for extra erect men, and for small or high shoulders; and less for stooping men, and for large or low shoulders. When these measures do not agree in this manner, there is evidently an error in one of them, and they must be measured over again. 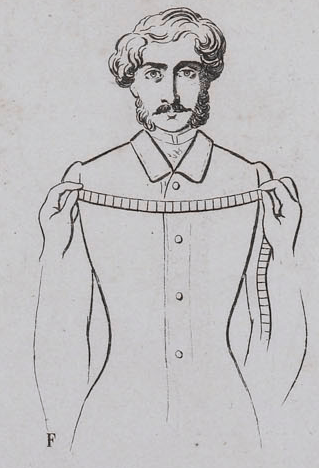 The Second Series, gives the measurement of all the parts which vary according to Fashion, or the taste of the client; such as the place of the hip buttons, the length of skirt, the size of sleeve, &c.
Diagram from Devere's 1856 drafting manual illustrating the measurements needed. Unfortunately, I was unable to find such clear images for the secondary series. These will have to be drawn out by hand or edited from existing examples like the image above. Taken from the back neck, to the level of the top of back plaits. This measure is of course variable according to Fashion. This is merely a continuation of the preceding measure, which is carried on from the notch to the bottom of skirt: its length is variable according to Fashion, taste, or the height of the client. These measures are taken in the usual way; first raising the arm square with the body and bending it at the elbow. 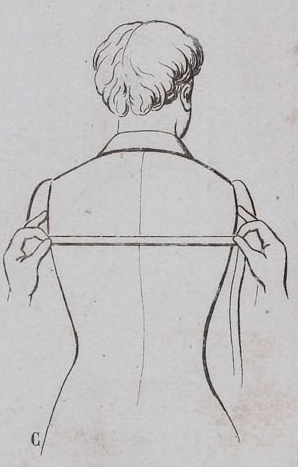 Then take the tape and place the end in the middle of back, opposite the hind arm seam; measure first the width of back, according to fashion or the style of coat required; and then continue the measure along the seam of the sleeve to the wrist. By deducting the width of back from the whole length, we obtain the true length of sleeve with great exactness. 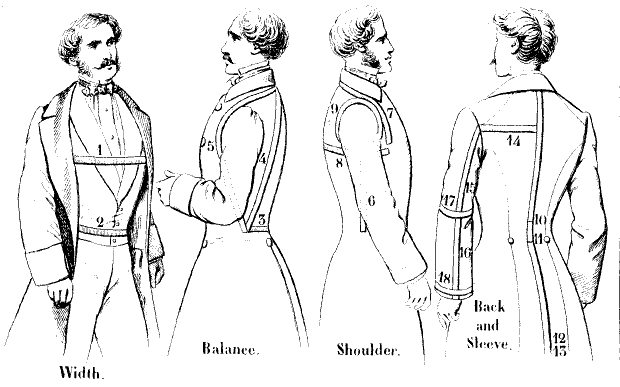 The width of back is usually about 7 ½ graduated inches, for all sizes and structures, and the length to wrist is 32 ½ inches in the proportionate man; which, deducting the back 7 ½, leaves 25 for the real length of the sleeve. The length of arm is subject to great variation: it will however as a general rule, be found in proportion to the height of the man. Taken according to Fashion, or the wishes of the customer. Measured tight, medium, or loose, as required. This measure, as well as the Elbow, should be written down as half, because it is only the half-measure that is used in drafting. The supplementary Series is always to be taken, whenever there is much deviation from the proportionate structure. 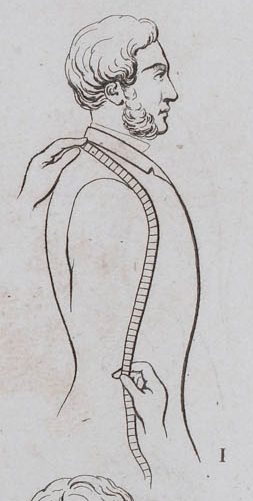 This Series of measures gives the exact form and position of the arm-hole: it shows whether the chest is round or flat, and the shoulder blades flat or prominent; whether the shoulder is high or low, large or small. Taken across the back, at the level of the bottom of back scye. When we are taking this measure as part of the Supplementary Series, its accuracy becomes of great importance, and we have first to notice whether the coat the client is wearing, has the seam of the scye at its proper place. If it is a Paletot or Paletot Jacket, the back stretch will probably be too wide; if he has on a close-fitting coat of the old fashioned English cut, (in which the armhole is very large), it will be too narrow. The true width of back stretch, should be two-fifths of the breast measure, and this proportion should but rarely be deviated from. It may however, be 3/8 more than this, for very stooping men, and 3/8 less for extremely erect ones. This measure gives the distance between the side point and the front of scye, and we obtain it by taking the tape between the thumb and forefing of each hand: then extend the other fingers square, those of one hand touching the front arm, those of the other hand touching the back of arm, and with the eye make the length of tape equal to the real diameter of arm. This measure is 5 ¼ in the proportionate structure. It may be ½ inch more or less, according as the shoulders are large or small, forward or backward, but never exceeds this limit of variation. To take this measure we pass a pencil through the loop and hold it against the front of arm with the thumb and forefinger of one hand; then pass the Tape under the arm, and carry it on with the right hand, as to touch the middle seam of the back at the level of the bottom of back stretch. In the proportionate man, the front of scye is 12 ¾, or equal to the back stretch 7 ½. And diameter 5 ¼, added together. It is important that the three last-named measures, Nos. 13, 14 and 15, should be taken with the greatest care and accuracy; and the student should practice taking them on the same man for some little time, and observe if the measures taken at different times are always alike. We generally find that there is at first, a tendency to take the diameter too small, and the front of scye too long. By the examination and comparison of these three measures, we can see at once what is the degree of round required to be given to the side seam. In most cases, perhaps 70 out of very 100, the degree of roundness required is that indicated on plate 4, fig. 1. But there are men whose structures vary in this point: some have the back round and the shoulder blades very prominent, while others have the back very flat and the blade bones h ardly indicated. Showing that half inch more round than usual, is required on the side seam of forepart. For a flat back, for an inverse reason, the front of scye will be found less, than the back stretch and diameter added together, and less round must be given to the side seam. 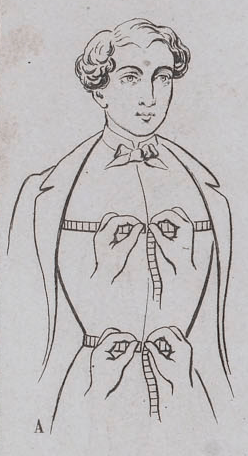 To take this measure well, hold the tape with the thumb and forefinger of each hand, and place the ends of the fingers against the front of each arm. We thus obtain the whole width of chest, which must be halved before writing it down. This measure is 8 ½ in the proportionate structure, or 1 more than the width of back stretch. It will be shorter or longer, according as the shoulder is forward or backward, or the chest flat or prominent. The use of this measure, is to show the degree of slope required to be given to the top of shoulder. The manner of taking it is shown by fig. 5 S. Pass the pencil through the loop at the end of tape; place one end against the side of neck, and hold the pencil horizontally with one hand; then with the other hand measure the distance between the pencil and the top of shoulder. The slope is 2 in the proportionate structure, but it may vary to 2 ¾ for very low or sloping shoulders, or decrease to 1 ½, 1, or even ½ an inch, for very high shoulders. We hardly ever find shoulders more sloping than 2 ¾, and even this degree is not often met with. High shoulders are more frequently found, though they never have less slope than ½ an inch, except in cases of deformity. Some men have one shoulder higher than the other, and for these the measures of both shoulders must be taken. Measured round the armhole in the usual way, and serving to show whether the shoulders are large or small: it is therefore useful in some cases, as a guide for the slope of shoulder. It also may be used in the draft of sleeve. It is usually about 2 ¼ less than the breast measure in the proportionate structure: if there is a greater difference than this, the shoulder is small, if a less it is large. In applying this measure to the pattern to prove the size of the armhole, care must be taken to deduct about ¾ of an inch for the stretching in front of the scye. We have now described the complete series of measures which we consider necessary, and we have, at the bottom of plate 4 shown on fig. 7 the manner in which, when taking these measures, we write them down in three distinct lines, each containing one series. In the first line we put first the Breast and Waist; then Curve, Bust, Side, and Depth of Scye. In the Second line. Length to the hip buttons, ditto to the bottom of skirt, then Width of back, Length of wrist, Width of Elbow and Wrist. In the Third line (when this series is taken), we put Back stretch, Diameter, Front of Scye, Chest, Slope and Round of Scye. The first series must always be taken in every case. The second series may be taken or not, as preferred. The Third series should always be taken, whenever it is seen that there is any great deviation from the proportionate structure. Be aware that that diagram above is from the 1856 edition, while I’m using the 1866 edition for my measurements. That’s why the numbers are not aligned with my measurement numbers. Hopefully these diagrams and accompanying text are of use to some of you.